This is a quick, easy and delicious way to prepare pork chops. The recipe comes from Rachael Ray. Preheat oven to 400°F. Line two baking sheets with foil and spray with non-stick cooking spray. Scatter the squash slices on the baking sheets, drizzle with olive oil and season with salt and pepper. Bake in preheated oven until browned, 20-30 minutes. Meanwhile, heat 2 Tablespoons olive oil in a large skillet. Season the pork chops with salt and pepper and place them in the hot pan. Brown them on both sides, about 6 minutes total. Reserve on a plate and cover with foil to keep them warm. Add the garlic and onions to the same pan and cook until softened. Stir in the vinegar, brown sugar and tomatoes and bring to a bubble. Return the pork chops to the pan and cook for 3-4 minutes to finish cooking them. 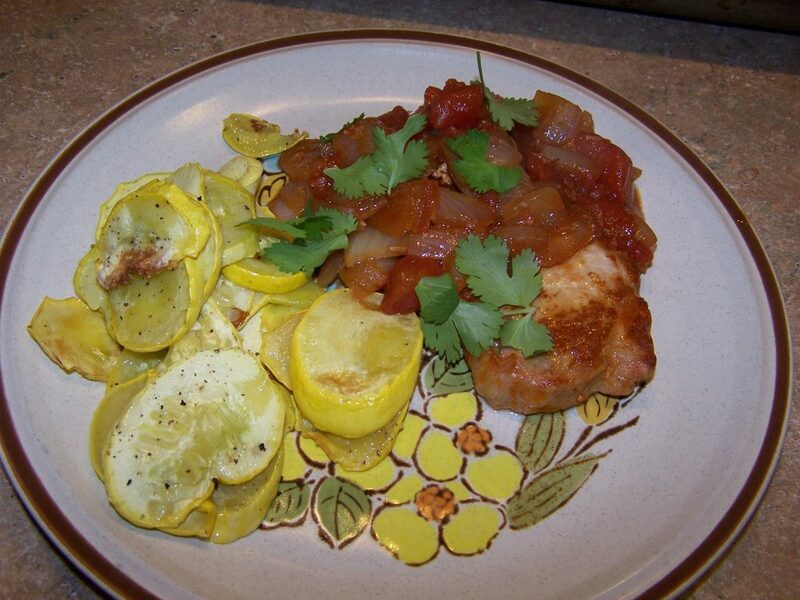 Serve the pork chops with the tangy tomato sauce on top and yellow squash alongside.